CarGurus has 22 nationwide LS 600h L listings starting at $9,500. Feeling green, but not willing to give up luxury and performance? Take a look at the 2014 Lexus LS 600h L. Few full-size, 5-passenger hybrid sedans offer the plush, the power or the gas-saving portfolio of this flagship Lexus limo, though it must be admitted that the Mercedes-Benz S400 Hybrid and the BMW ActiveHybrid 7 are in the same ballpark. Alas, none of these premium gas/electric chariots are going to come cheap. In any case, Lexus’ top-shelf 4-door gas/electric LS 600h L is delivered in a single self-described trim that sports an additional 5 inches of overall length over its standard-size LS siblings. And new for this year, this high-flying hybrid boasts Apple’s Siri Eyes Free steering-wheel-mounted controls that mate with the touted Enform-integrated smartphone apps for efficient and safe access to Pandora and iHeart radio, as well as hands-free audio adjustments and communications. Of course, full-time all-wheel-drive (AWD) remains standard to allow a bit more cornering agility while standing by to divert torque from the wheels that slip to the wheels that grip when things get slippery. Oh, and the well-wrought Adaptive Variable Air Suspension system with 3 driver-selectable settings assures everything from a comfy touring-style ride to a fuel-saving highway cruise to a sporty and adventurous commute, depending on your mood. Unfortunately, trunk space is a mere 13 cubic feet, as the large-capacity battery pack remains stashed beneath and takes a good 5 cubic feet away from the standard LX’s 18-cubic-foot trunk space. Anyhow, the 2014 LS 600h L packs a 5-liter variable-valve-timed (VVT) gas V8 that mates with a pair of electric motors to put out a total of 438 hp and 385 lb-ft of torque. The electronically controlled continuously variable transmission (CVT) again boasts a 2-speed reduction feature and a Snow mode for overcoming challenging weather and traffic conditions, while mileage numbers remain an impressive 19 mpg city/23 highway. Standard appearance features, meantime, include 19-inch alloy wheels, a power sunroof and heated, reverse-tilt power-adjustable mirrors, while premium leather upholstery is bolstered by alloy and genuine wood cabin accents. Heated, power-adjustable front seats also come standard, as do heated rear seats, while the power sunshades keeps those in the back cool and comfy, with an assist from dual-zone climate control with rear fan-speed control. Convenience-wise, look for standard cruise control and telescoping tilt-wheel steering to return for the 2014 edition, along with a rear-view camera, front and rear parking sensors, memory for driver's and front-seat passenger settings, and a heated steering wheel. Meanwhile, delivered techno-goodies include standard HDD navigation, complemented by an Enform/Bluetooth infotainment and communications package that counts a Mark Levinson 450-watt premium stereo system with a single-CD player, 19 speakers, satellite radio, a video monitor and rear audio controls among its notable attributes, along with the aforementioned Siri Eyes Free system. One of the more intriguing options, indeed the only available add-on of note, is the pampering and posturing Executive Seating Package. Taking advantage of the stretched-out proportions of the 2014 LS 600h L, this posh package plunks a large console in the rear center seat slot, along with providing a power-operated leg-rest, side-mounted rear airbags, a wood-trimmed table/desk, cooled beverage bins and rear-seat DVD entertainment. Now that’s how to get from here to there in style. Safety-wise, look for this luxury-laden Lexus hybrid to come with standard 4-wheel antilock brakes (ABS), traction and stability control, front and rear head airbags, front side-mounted airbags and front head restraint whiplash protection. Daytime running lights, front fog/driving lights, LED adaptive and self-leveling headlights also come standard, as do turn-signal-integrated mirrors, blind-spot monitoring and a remote antitheft alarm, while Lexus’ Enform-interfaced Safety Connect system stands ready to provide emergency assistance and communications. Optional safety features, meantime, include the Advanced Pre-Collision System Package with driver awareness monitor, pedestrian detection alert and radar-interfaced adaptive cruise control. 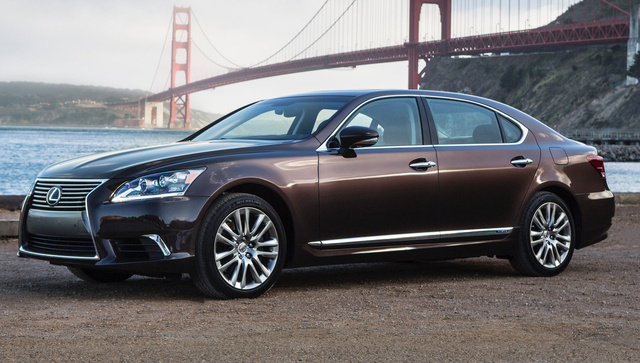 What's your take on the 2014 Lexus LS 600h L? Have you driven a 2014 Lexus LS 600h L?